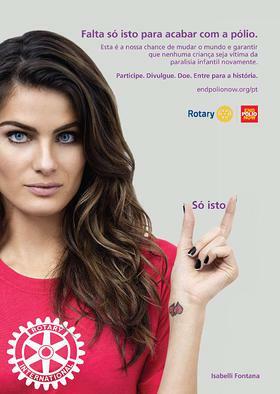 Brazilian model Isabeli Fontana has joined the growing roster of public figures and celebrities participating in Rotary's “This Close” public awareness campaign for polio eradication. Star of many advertising campaigns, high fashion reference, Victoria Secret angel, and new face of L’Oreal for Latin America, Fontana has also an important role as mother of Zion, 10, and Lucas, 7. Attuned to the importance of vaccination, she supported the national immunization campaign in Brazil for the first time when she took her youngest son to get the oral polio vaccine drops directly from the Brazilian Minister of Health, Alexandre Padilha at an event launching the 2011 national immunization campaign. Her interest in impacting the world and lives of children has continued to grow. “I accepted the invitation to participate in Rotary’s global campaign because polio has to be ended. It is an achievable goal,” said Fontana. "Our generation has already helped get the world 99 percent polio-free and we could make polio the second disease ever eradicated after smallpox. Without eradication, every nation remains at risk for infections “imported” from the endemic countries. As a mother and Brazilian, I believe I cannot be indifferent to problems, especially the ones that have a solution. The disease has no cure, but can be prevented with vaccination," she explained. In the past, Fontana has worked with the Brazilian Foundation Abrinq designing clothing lines in conjunction with the brands Morena Rosa and Un.i Lingerie where part of each purchase was donated to projects for children. She also supported blood drives for the Pro-sangue Foundation in Sao Paulo. But the charitable work with polio and Rotary is her first in a global scale. The Rotary awareness campaign also features public figures and celebrities including Bill Gates, co-chair of the Bill and Melinda Gates Foundation, Nobel Peace Prize laureate Archbishop Emeritus Desmond Tutu, action movie star Jackie Chan, Psy, golf legend Jack Nicklaus, conservationist Jane Goodall, premier violinist Itzhak Perlman, Grammy Award winners A.R. Rahman, Angelique Kidjo and Ziggy Marley, and peace advocate Queen Noor of Jordan. In addition to the ad campaign, Isabelli Fontana has also joined Rotary’s innovative digital campaign to develop the World’s Biggest Commercial to raise public awareness about polio eradication. Participants simply upload photos of themselves making the “this close” gesture with their fingers – as in, “We are this close to ending polio” – to the ever-expanding promotional spot at Rotary’s End Polio Now website. Since the beginning of August 2012, more than 33,000 participants from 152 countries collaborated with the effort. Brazil alone got more than 3,500 insertions, including the ambassador Isabelli Fontana, singer Michel Telo and actor Thiago Lacerda. Along with helping Rotary set a new Guinness World Record, every person who joins the commercial can choose to add their name to a petition urging the world’s governments to provide the US $5.5 billion needed to finish the job and end polio forever. Four billion of these funds were pledged in April 2013, at the Global Vaccine Summit. Rotary club members worldwide have contributed $1.2 billion and countless volunteer hours to the polio eradication effort. Great progress has been made, and the incidence of polio infection has plunged from about 350,000 cases in 1988 to 223 reported cases in 2012. More than two billion children have been immunized in 122 countries, preventing five million cases of paralysis and 250,000 pediatric deaths. Only three countries remain polio-endemic: Afghanistan, Nigeria, and Pakistan. Rotary donated US$ 6 million to end polio in Brazil, as well as US$38.5 million to PAHO countries. To date, Brazilian Rotary club members have contributed more than US$12.37 million for the eradication campaign around the world.